In today’s race to attract and retain top talent, the ability to create and deliver professional HR paperwork quickly is a competitive advantage. But for departments still relying on paper forms, manual approvals, data rekeying, and ink signatures, HR processes can take weeks—frustrating employees and candidates. Worse, delays in opening job requisitions, hiring, and onboarding can impact your company’s productivity. 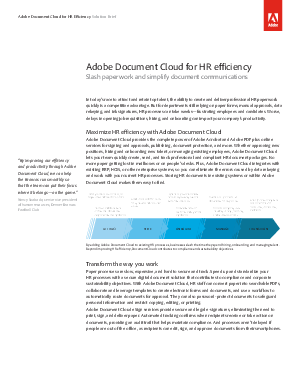 Download this white paper to learn more about how Adobe Document Cloud can help HR reduce costs, maximize efficiency while and increase organizational agility.